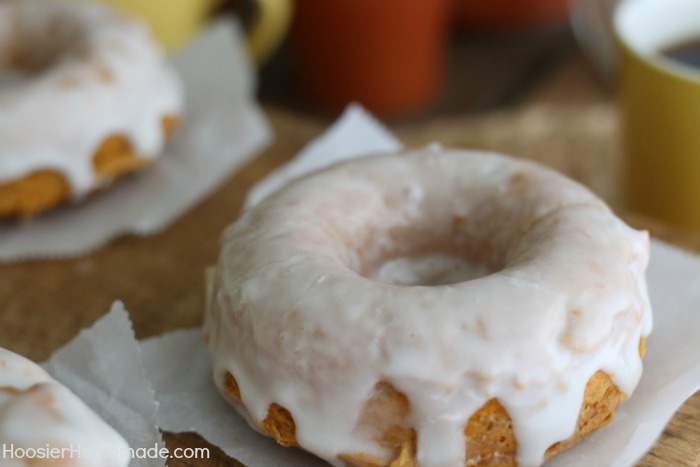 With only 3 ingredients, you can have these delicious Easy Homemade Pumpkin Doughnuts! Add a simple 2 ingredient glaze and they are out of this world! Grab a cup of coffee, because you are going to want a couple of these amazing Homemade Doughnuts. Who doesn’t love a warm, freshly baked doughnut? Not to mention a freshly baked doughnut with a hot cup of coffee? The pair is like the perfect marriage really. The two go hand in hand. This time of year makes me not only think about doughnuts and coffee, but about everything pumpkin as well. 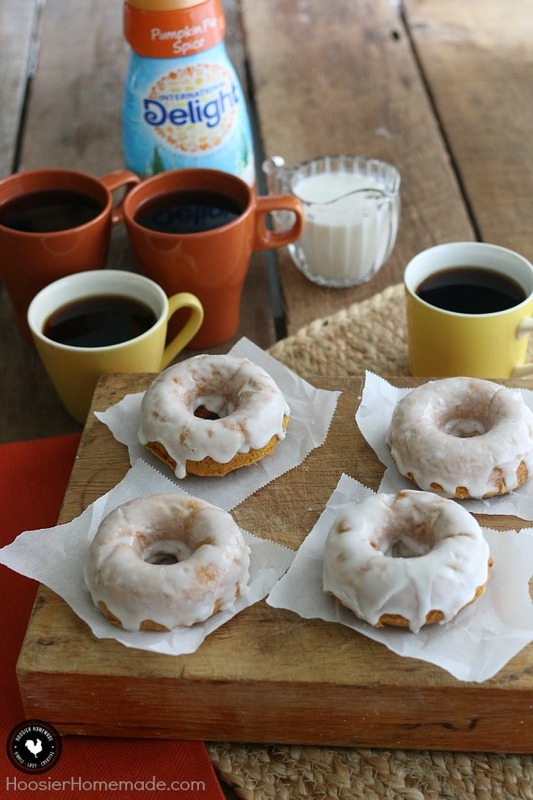 What would be more perfect than a pumpkin doughnut with your coffee? The only thing I think would top that is a pumpkin doughnut that you make from the comfort of your own home, in your cozy kitchen, where all the smells of them baking will make it extremely difficult to wait until the oven timer beeps. When I think of making pumpkin goodies, I have often made muffins or bread. I have always envisioned doughnut making as something that has to be down to an art – deep fried in the hottest of oils and taken out carefully to cool. What I didn’t realize is that it can be MUCH easier. I can actually BAKE doughnuts, as well! This recipe has changed my life. No longer am I intimidated about making doughnuts, but I can make them at home and add one of my favorite Fall flavors – pumpkin spice – simply by using delicious International Delight Pumpkin Spice coffee creamer into the glaze. So now, I can have pumpkin in my doughnut AND my coffee. And I don’t have to leave my house. I’m pretty sure I just died and went to heaven. As you know, I am a huge fan of the International Delight Coffee Creamers. Not only in our coffee, but in many of the desserts, cupcakes, and sweet treats that I have shared with you. These doughnuts are so easy to make and just require only 3 ingredients. All you need is a cake mix, pumpkin puree and pumpkin pie spice. To send the Pumpkin Doughnuts over the top, add a simple glaze made with powered sugar and International Delight Pumpkin Pie Spice Creamer. A doughnut pan is fun, but not required. These also bake nicely in mini-muffin tins, they turn out almost like doughnut holes. These are such a treat. I haven’t seen my family this excited about breakfast since I brought home a box of doughnuts from our local grocery store – and from the way it’s going now, I doubt I will ever be doing that again. For giveaways and coupons, sign up for the International Delight Newsletter. It’s FREE! 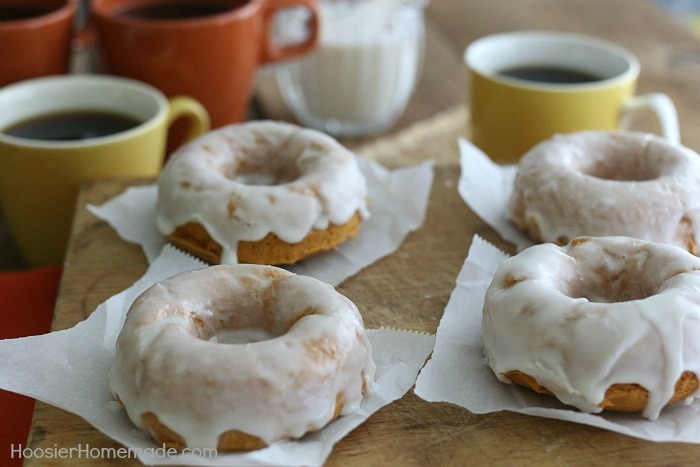 With only 3 ingredients, you can have these delicious Homemade Pumpkin Doughnuts! Add a simple 2 ingredient glaze and they are out of this world! 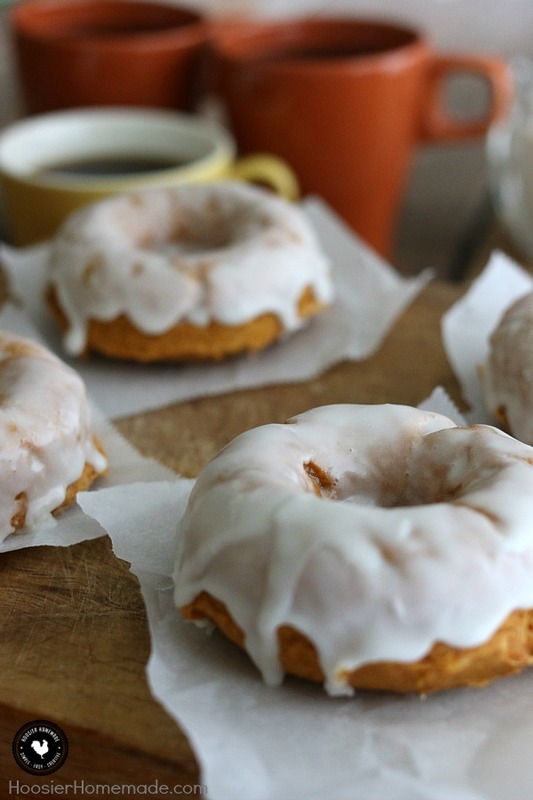 Grab a cup of coffee, because you are going to want a couple of these amazing Homemade Donuts! Fill doughnut pans about 1/2 full. I used a cookie dough scoop and added 3 scoops then spread the dough with the back of a spoon to even it out. After the doughnuts are cooled, dip into the glaze and set on a cookie sheet or rack. Be sure to add a pan underneath to catch the extra glaze. These donuts look fantastic! Thanks for linking up with What’s Cookin’ Wednesday! Thanks so much for stopping by! Looking forward to the party this week! These look so perfect to make on a cozy fall weekend! I’ll have to try these. So much better than frying. Thanks for the recipe. Thanks so much for stopping by Debbie! Wow, I am amazed that these with a cake mix. I always made the ones that you deep fried and I try to stay away from those. How easy are these!!! 🙂 They look so yummy! !